Frontier is a specialist recruitment provider employing professional engineers and professional recruiters working together to optimise our engineering & technical recruitment effectiveness. We focus on recruitment for engineering and technical roles within the oil and gas industry. Frontier maintains a database of over 35,000 screened industry professionals covering all the oil industry engineering and technical disciplines. We provide permanent staff personnel, contract personnel and managed project teams. Established in Aberdeen by oil industry engineers in 1999, Frontier understands operator and service company recruitment requirements. 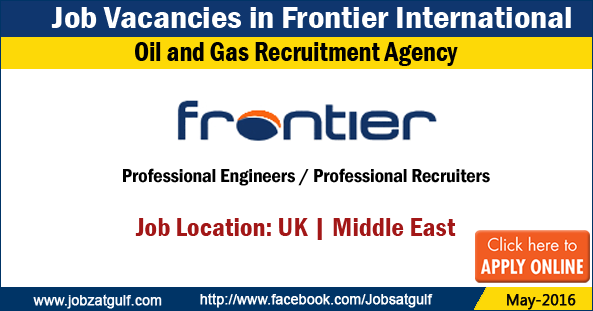 In response to client demand, Frontier has specialised in engineering & technical recruitment across all oil & gas disciplines for major operators, independent oil companies and oil and gas service companies.